SUMMARY: We report a case of symptomatic epidural gas accumulation after open diskectomy, causing lumbar radiculopathy. Surgery had been performed in a 44-year-old man for disk extrusion; however, he was readmitted to the hospital with increased lower back pain 5 months after the operation. CT and MR studies demonstrated accumulation of gas in the lumbar epidural space compressing the dural sac and nerve root. Symptoms disappeared after surgical removal of the gas. Free air in the spinal canal has been reported in a number of situations—including craniocervical trauma, epidural anesthesia, and spinal surgery—and is usually not symptomatic.1 The vacuum phenomenon known as gas accumulation in the intervertebral disk space is the most common source of gas release into the epidural space through the tears of annulus fibrosis. To the best of our knowledge, only 2 cases of epidural gas after open diskectomy have been reported in the literature.2,3 The aim of this report was to demonstrate the CT and MR imaging findings, especially the combined use of these 2 modalities, in symptomatic spinal epidural gas following open diskectomy and alert radiologists to this potential complication. To the best of our knowledge, this is the first postoperative symptomatic epidural gas case without recurrent disk hernia that was illustrated by both CT and MR imaging. A 44-year-old man presented with lower back pain and hypoesthesia of bilateral L5 dermatome. A CT scan showed a herniated L4–L5 disk as well as some low attenuating areas corresponding to air and vacuum within the disk space (Fig 1). MR examination confirmed the disk herniation and also exhibited the signal void areas consistent with gas (Fig 2). He underwent right partial hemilaminectomy, foraminotomy, and diskectomy at the L4–L5 level. His symptoms resolved during the postoperative period, though he returned to the hospital 5 months after the discharge complaining of lower back pain. He was re-evaluated clinically and with imaging studies including radiography, CT, and MR imaging. The straight leg-raising test was positive on the right at 45°. There was no motor or sensory deficit. Radiographs showed the narrowing of the L4–L5 disk space, vacuum phenomenon, and right partial laminectomy defect. The L4–L5 level was stable. MR imaging was performed with a 1.5T scanner in axial and sagittal T1-weighted (TR, 477 milliseconds; TE, 14 milliseconds; section thickness, 4 mm) and turbo spin-echo T2-weighted (TR, 3500 milliseconds; TE, 120 milliseconds; section thickness, 4 mm) sequences with and without fat saturation. A T1-weighted scan was repeated after intravenous administration of paramagnetic contrast media to be able to exhibit the postoperative granulation tissue. Both T1- and T2-weighted images showed an epidural, signal void, space-occupying, cystlike nonenhancing lesion suggesting air or calcified disk fragment (Fig 3A–C). Granulation tissue in the surgery site and around the gas enhanced after administration of intravenous contrast media. A subsequent noncontrast CT of the lumbar spine confirmed a well-defined, ovoid air-attenuation accumulation in the right anterior epidural space (Fig 3D). The gas was compressing the dural sac and right L5 nerve root on both CT and MR images. The patient received conservative medication for a month, but his neurologic condition did not improve. Follow-up surgery was performed, in which no herniated disk was found and postoperative granulation tissue with entrapped gas collection was removed. The patient remained symptom-free for a 6-month follow-up period. An axial CT scan reveals posterior disk herniation containing air. Vacuum phenomenon was also noted within intervertebral disk space. A preoperative axial T1-weighted (TR, 477; TE, 14) MR image shows a herniated disk containing signal void air bubbles. 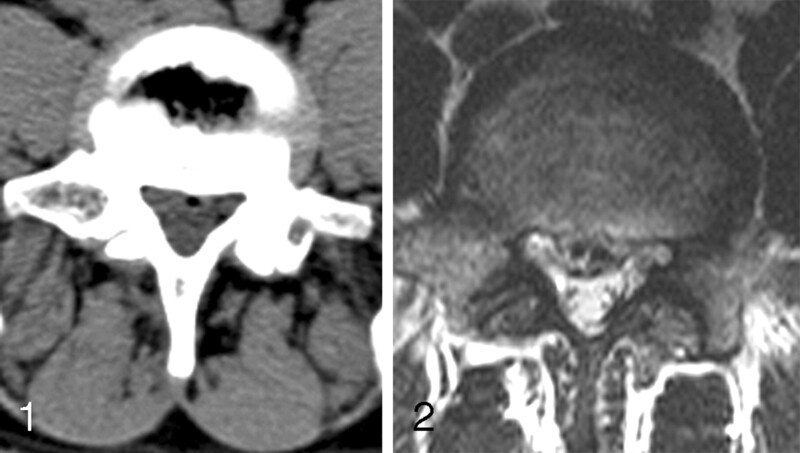 Postoperative axial and sagittal MR images of lumbar spine before and after administration of intravenous contrast media and noncontrast axial CT scan. A, An axial T1-weighted (TR, 477; TE, 14) MR image shows a signal void gas accumulation in the right anterolateral epidural space compressing the dural sac and displacing the right L5 nerve root to the posterior. B, An axial postcontrast T1-weighted MR image at the same level with Fig 1A demonstrates granulation tissue enveloping the signal void gas. C, A sagittal fat saturated T2-weighted (TR, 3500; TE, 120) MR image reveals the signal void gas collection at the level of L4 vertebra inferior endplate. Disk space narrowing and degeneration at the L4-L5 endplates were also observed. D, An axial CT scan confirms the ovoid cystlike gas occupying the right lateral recess. Gas in the intervertebral disk space is a relatively common radiologic finding, seen in ≤46% of cases on CT examinations.4 It is very rare to find gas in the spinal canal, and it is almost always associated with vacuum within the intervertebral disk. This suggests that the gas can leak from the disk space to the epidural area through the tears of annulus fibers mostly with herniated fragments.5 Trauma, pyogenic infections, pneumothorax, and iatrogenic instrumentation such as percutaneous vertebroplasty are the other less-common underlying mechanisms.1 Epidural gas is sometimes present in asymptomatic patients. Herniated disk fragment associated with air pseudocysts may rarely cause radiculopathy and may necessitate surgical excision of the cyst wall if not resolved with conservative therapy.1 Gas may rarely form a pseudocyst without disk material and cause impingement on the dural sac and nerve roots with symptoms identical to those of herniated disk.6 Salpietro et al reported the importance of a complete microdiskectomy and an accurate removal of the involved portion of posterior longitudinal ligament to prevent new pseuodocystic gas formations.7 In this case, we observed vacuum phenomenon in the intervertebral disk space with intradiskal extension as signal void areas on preoperative MR images. We propose incomplete curettage of this gas during disk removal and/or new gas leakages from the intervertebral disk space through the cracks after previous surgery may have contributed to the formation of gas accumulation in our patient. MR imaging with its multiplanar imaging capability is the technique of choice for the evaluation of degenerative disk disease with detailed information about lesion morphology, disk condition, and the status of adjacent neurologic structures. Postcontrast MR imaging can also demonstrate the postoperative granulation tissue entrapping gas. In our case, this entrapment prevented the mobility of air and compressed the neighboring tissues. MR, however, has some limitations in the assessment of structures that contain air and calcification, including disk fragments. On all MR images, gas and calcification typically appear as signal void areas. T1- and T2-weighted MR images of epidural gas show an ovoid, signal void area, occupying the epidural space. Depiction of the mass effect of gas to the adjacent neurologic structures due to gas, if present, is better delineated with MR imaging. On the other hand, accompanying vacuum phenomenon in the intervertebral disk space and gas accumulation in the epidural space can be better characterized with CT by its typical attenuation values. The present case underscores the importance of using combined CT and MR imaging in postoperative disk herniation by demonstrating the characteristic attenuation of gas on CT imaging and contrast-enhanced granulation tissue entrapping the gas on MR imaging. The presence of intraspinal gas on CT scans and a signal void epidural cystlike lesion on both T1- and T2-weighted MR images, especially after disk surgery, should suggest the diagnosis of epidural pseudocystic gas formation due to leakage. We also suggest presence of granulation tissue surrounding the epidural gas is a predictor for surgery. Although MR imaging is the preferred imaging tool in the assessment of disk pathologies, when signal void areas are seen, CT imaging should be added as a complementary technique to differentiate between calcified disk fragments and gas.